New Zealand striker Chris Wood is undoubtedly the current poster-boy of New Zealand football heading into next month’s do-or-die 2018 FIFA World Cup Russia™ play-off against Peru. A record haul for Leeds United last season was followed by a goal at the FIFA Confederations Cup, and that prolific form has continued in the English Premier League following a recent move to Burnley. However, anyone that believes Wood’s giant frame at the top of the frontline indicates New Zealand’s approach is based purely around physique and high balls would be wrong. The Kiwis boast numerous technically gifted wide players with Ryan Thomas, Marco Rojas and Kosta Barbarouses among them. But it is the latter that has the most experience alongside the Kiwi goal-machine. Now 27 and arguably in career-best form, Barbarouses’s experience playing with Wood goes all the way back to the 2007 FIFA U-17 World Cup when the wide-eyed teenagers were taking their first tentative steps on the international stage. It is a journey that will truly have come full circle if New Zealand can manage to upset Peru and win through to a second World Cup in three attempts. 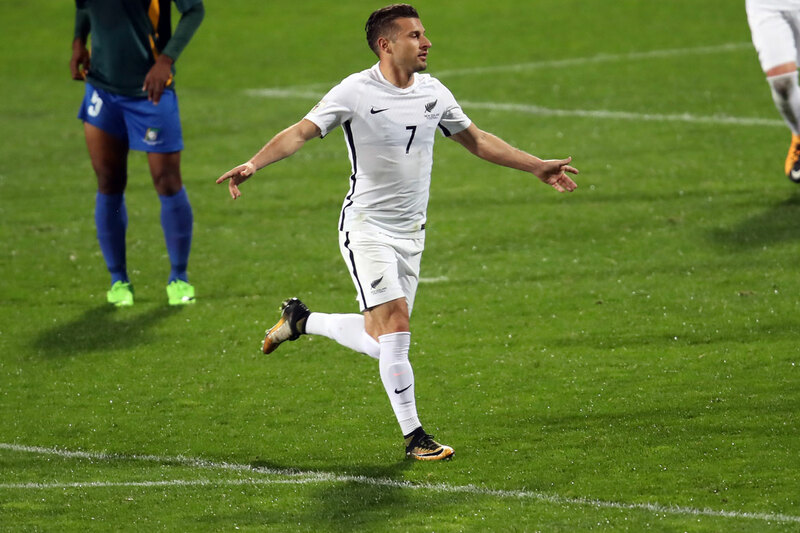 Barbarouses, who is now approaching 50 international caps, believes he complements Wood and the other offensive personnel in the All Whites ranks. “There is a good balance between us, and obviously Marco [Rojas] in that sort of role,” Barbarouses said. “Playing off Woodsy [Chris Wood], we have a good combination. Woodsy always does well for the national side. “Historically we have gone with maybe two big guys up front. That has changed with the new gaffer [coach Anthony Hudson] and I think it is working really well. “We are all really proud and happy for Woodsy to be rewarded with a move to the Premier League,” Barbarouses added of the team’s vice-captain who led the side at this year’s Confederations Cup in the absence of the injured Winston Reid. While upcoming opponents Peru and most other Russia 2018 aspirants have been kept busy with regular World Cup qualifiers, New Zealand’s competitive matches have been relatively infrequent. Last year’s OFC Nations Cup was followed by just six further qualifiers. The long-term plan has undoubtedly included keeping one eye on building towards a possible intercontinental play-off. For New Zealand it will be a third in succession following a famous victory over Bahrain in 2009, and then a hefty defeat against Mexico four years ago. “Three years of hard work, and we are now at the final hurdle of World Cup where everyone is trying to get to,” says Barbarouses, who has just returned to A-League heavyweights Melbourne Victory, having been one of the competition’s most consistent performers for many seasons. Four years ago New Zealand crashed to a 7-3 aggregate defeat against Mexico. But positives can come out of every negative. “The experience of going through the intercontinental play-off four years ago definitely does help,” said Barbarouses. “It prepares those boys that were there, and there is a fair few of us. We know what to expect and the difficulties we will face.